The Spruce Creek Public Works will be commencing work on a drainage and road construction project on Seclusion Drive. Starting on 4/7/2008, Seclusion Drive from Cessna Blvd. 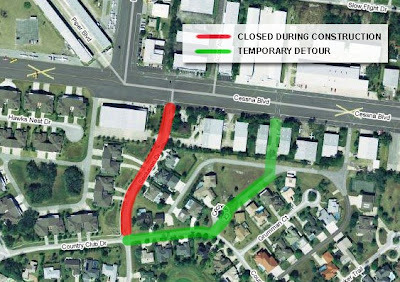 to Country Club Drive will be closed for approximately 8 weeks. Access to Cessna Blvd. will be via a detour through Country Club Drive to Cochran Court. A temporary road will be constructed from Cochran Ct. to Taxiway Uniform continuing to Taxiways Whiskey and Victor. Detour signs will be posted & POA Security Officers will be on duty as necessary to assist with traffic control.